Though it may be new to American drivers, the turbocharged 2012 Buick Regal GS evokes a powerful sense of déjà vu—if you’re a connoisseur of GM marketing campaigns, that is. 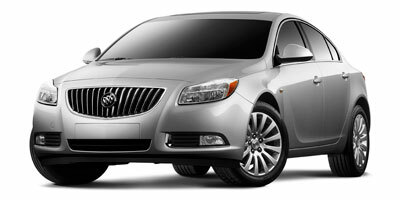 The “sport-injectedâ€ Regal, you see, is the centerpiece of Buick’s reinvention as a younger, hipper brand. “Turbo…Buick. Turbo…Buick,â€ intones the voiceover in a recent commercial as the urbane young pilot guides his Regal through a series of curves. In other words, this rebadged Euro-market Opel Insignia is not your grandfather’s Buick. No, it’s Buick’s version of the Oldsmobile Cutlass Supreme. This little gambit didn’t work out so well for Oldsmobile, judging by the fact that GM killed off the entire division 16 years later. Will the next generation be kinder to Buick? We can’t answer that, but we can tell you what we think of the 270-horsepower Regal GS. Being a rebadged Opel performance sedan, the Regal GS rides and handles like a proper European car—it’s got that firm, composed character that the German government seems to require. The standard six-speed manual gearbox is quite user-friendly. The front seats are comfortable and supportive. When the boost comes on in second gear, the turbocharged motor’s kind of fun. Although the Regal itself isn’t small, the backseat is, ranking down there with the cramped rear quarters of the outgoing BMW 3 Series. The dashboard’s drab mélange of buttons and knobs struck us as unintuitive, even after a week of driving. Those 270 horses feel more like 220 under most circumstances, and they’re thirsty little ponies at that. In light of the Regal GS’s ho-hum performance and forgettable interior, its starting price of $34,450 seems awfully high. First impression? Skip the 20-inch wheels, a $700 option that came with our test car. One thing the already taut Regal doesn’t need is less ride compliance, and that’s an inevitable consequence of slapping dubs on a midsize sedan. 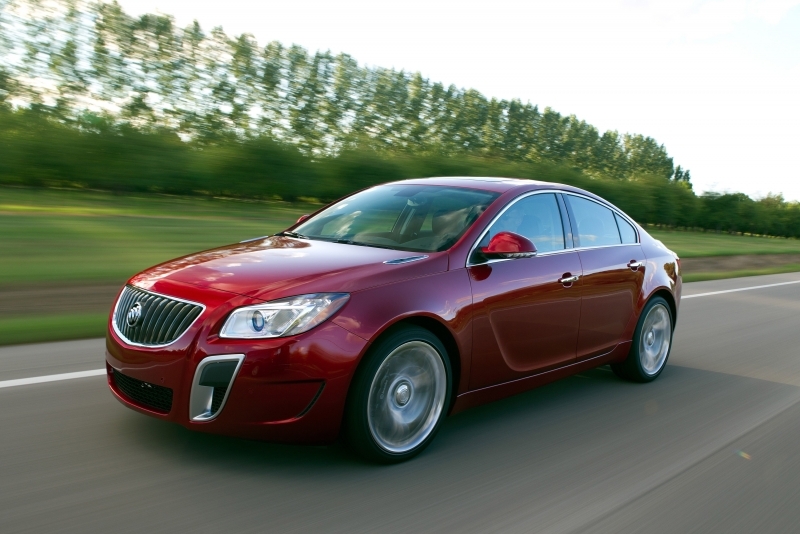 Still, you can tell that the Regal GS has strong fundamentals. The suspension is firm, but it’s not punishing; meanwhile, it keeps the car pleasantly flat and composed in corners, even while the open differential struggles to put all that turbocharged power to the pavement. Short of the Cadillac CTS and perhaps the Ford Focus, this Buick might have the best all-around suspension of any American car. The electronic adjustability of the dampers needs work, however, as we couldn’t discern a difference between “Sportâ€ and “GSâ€ modes—and both were too jittery for urban driving. The default setting, on the other hand, was fine, but we chose Sport anyway because the default throttle response is lazy, and there’s no way to adjust the throttle and dampers separately. 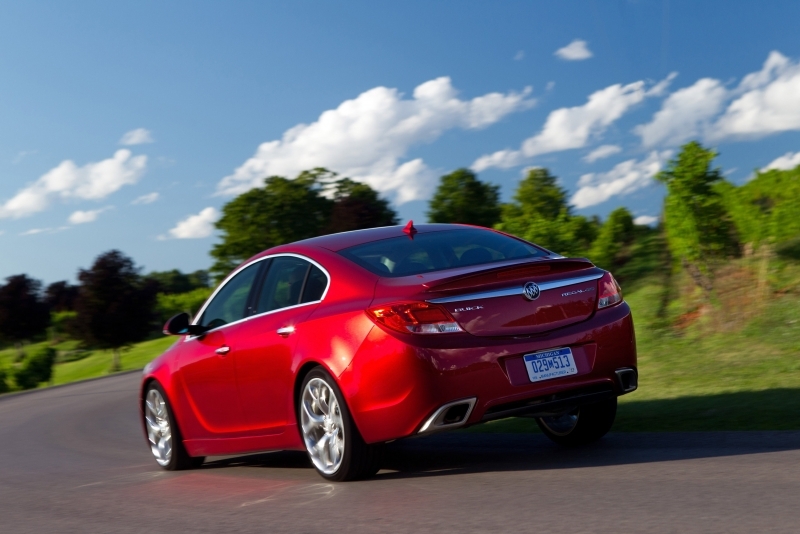 The 2012 Buick Regal GS is powered by a 2.0-liter inline-four that’s turbocharged to the tune of 270 horsepower and 295 pound-feet of torque. A six-speed automatic will be offered later in 2012, but as of this writing, a six-speed manual is the only transmission you can get. That’s right—a manual-only Buick. Happily, it’s an agreeable unit, pairing a light, forgiving clutch with a similarly accommodating shifter. As for the motor, the best way we can describe it is to compare the 3,700-lb-plus Regal GS to the suspiciously powerful, and considerably lighter 2.0-liter turbo-powered Volkswagen GTI. There’s a similarly strong midrange punch, but the GS’s motor lacks the GTI’s linear pull to redline. It also doesn’t sound nearly as fruity; in fact, the engine itself is almost silent, which draws attention to the clearly audible hissing and popping as the turbocharger does its thing. The EPA pegs the Regal GS at 19 miles per gallon city, 27 mpg highway, and 22 mpg combined. That’s about as bad as it gets for this kind of car. The new four-cylinder BMW 328i turbo, for example, is expected to have highway mileage well into the 30s, while both the 274 horsepower Kia Optima turbo (22/34/26) and the 268 hp Toyota Camry SE V6 (21/30/25) easily out-green the Buick. The Regal GS has been produced in Opel Insignia form since 2008, so we didn’t expect it to be bursting with bleeding-edge technology. We did, however, expect the $1,145 touchscreen navigation/infotainment system to be a lot better than it is. For starters, the design is so ten years ago with its goofy-looking virtual buttons and cheesy background gradients. Then there’s the functionality, which isn’t much better. Example: the system simply refused to display a couple music folders on our USB flash drive. We tried renaming the folders, then deleting all of them and reloading. No joy. We’d suggest keeping that $1,145 in your pocket. As for other notable features, well, there aren’t many. You get power front seats, Bluetooth, and dual-zone automatic climate control as standard, but that’s par for the course at this price point. Otherwise, the Regal GS is basically just a car. Geeks need not apply. The Regal GS’s build quality was thrown into question the first time we changed gears, as our test car had a loose kick panel to the left of the footrest that snagged the side of our clutch shoes. On a broader inspection, we liked the resilient Euro-style leather upholstery on the seats but found the cabin materials mediocre relative to those in an A4 or 3 Series. Seat comfort is laudable in front, with a just-right mix of firm support and lateral bolstering, but the backseat is surprisingly snug for heads and knees. We also docked the Regal a few points for its confusing control layout. Just about everyone who beheld our GS was attracted it, including, yes, representatives of the next generation. The Regal is a pretty stylish car, and we had to admit that the 20-inch wheels looked cool when we weren’t complaining about how they felt. We could do without the GS-specific front air intakes, however, which look like giant snorting nostrils on an otherwise sleekly proportional face. By starting the Regal GS at $34,450, Buick is signaling that the car competes with entry-level luxury sedans like the 2012 Audi A4 Quattro ($33,200 to $34,500), the redesigned 2012 BMW 328i ($35,795), and the Mercedes-Benz C250 ($34,800). On paper, that makes sense, but if you test-drive all of the above, we think you’ll find that they’re a little out of the Regal’s league. Indeed, we suspect the Regal GS would have its hands full with the $26,500 Kia Optima SX or the $26,640 Toyota Camry SE. But you be the judge—get out there and try these cars for yourself. The Regal GS is, how shall we put this, a challenging proposition. As long as it’s stickshift-only, forget it; but even with the automatic, we’re not seeing a lot of value in this $35,000-plus package.